Fans of the Walking Dead TV series will definitely be more than familiar with the actual motions of violence going on in there, where a quick swing of Michonne’s katana would definitely have lopped off the head of many a zombie, not to mention sawed them undead – er, walkers, in half or more parts. 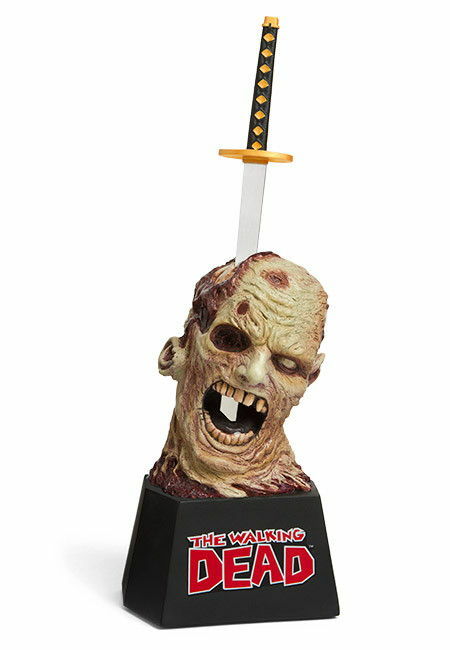 Well, if you would like to bring a little bit of the gore from the Walking Dead series right to your work desk, perhaps this $89.99 Walking Dead Zombie Letter Opener would be worth checking out? It comes with a removable miniature katana that you will make use of in order to slice open your mail, and when you are done, simply slide it back into the zombie skull.